Joe Reynolds is my videographer for the Footprints of God series now showing on EWTN. 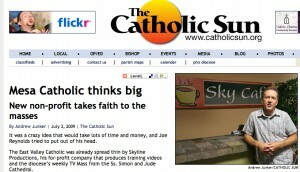 Recently he started Kolbe Productions, a non-profit to produce excellent and exciting Catholic video and TV projects. We are currently working on several projects together including Defenders of the Faith and a new pilgrimage DVD series. 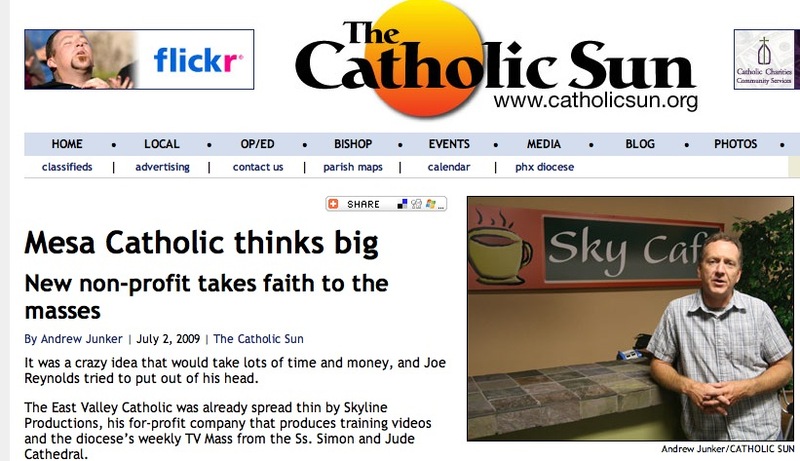 The Catholic Sun interviewed Joe and I — and here is the interview! Today I ran 10 miles in 92 minutes and weighed in at 152 pounds — down from 183 pounds on January 1. I have never felt better, though today I am a bit tired :-) When people notice my weight loss they ask, “Did you get sick?” I say, “Yup, sick of being overweight, tired and out of shape!” Blood pressure, cholesterol, glucose and other factors are now all low and the doctor said I am in great shape — without using drugs. My blog posts on our efforts: here and here. You can do it too! 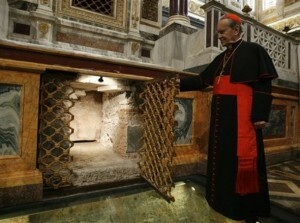 As he presided at ceremonies closing the Pauline Year, Pope Benedict XVI made the dramatic announcement that new scientific tests have strengthened the traditional belief that human remains buried beneath the altar of the Roman basilica of St. Paul-outside-the-Walls are those of St. Paul himself. 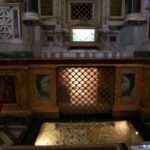 My Video Showing the end of St. Paul’s Life and the Place of his Bones which I Made Last October in Rome. Enjoy! 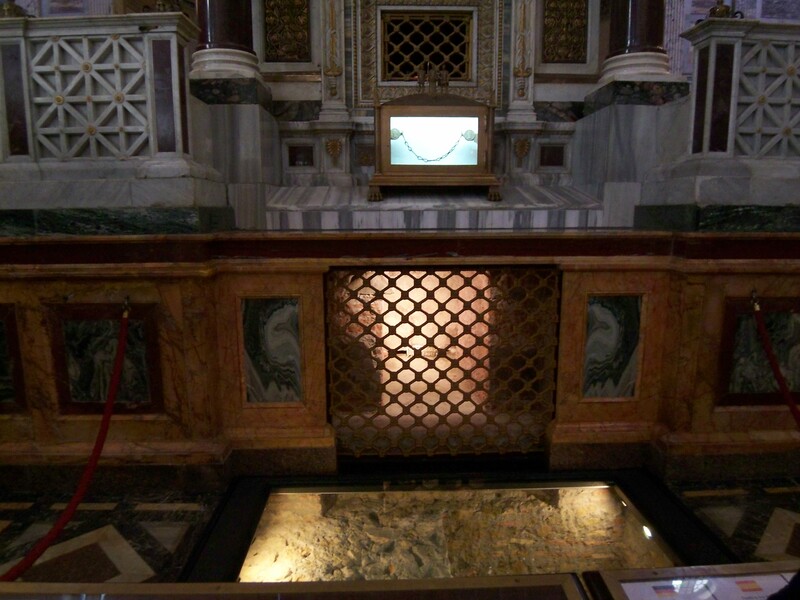 From the Pope’s words June 28, 2009: “Vatican City (AsiaNews) – With “great emotion” Benedict XVI announced that a recent scientific probe confirmed what Catholic tradition has always held, namely that the body of the Apostle Paul is located under the papal altar in the Basilica of Saint Paul Outside the Walls. The announcement was made today in the basilica itself during the homily of the First Vespers of the Feast Day of Saints Peter and Paul, which brings the Pauline Year to a close, a year that was held to celebrate 2,000 years since the birth of the Apostle of Tarsus. Has the Pope’s Paper Lost its Mind? I have always loved watching birds and discovering every sort of animal and creature. Ove the last few years I’ve kept a list of all the birds and other critters I’ve seen. Many of them I encounter on my runs in the morning. Here is the list for those who might be interested.